We've come to the final installment of the series "The ABC's Of Dealing With Negative People." We've looked at various ways to protect and conduct ourselves when faced with negative people. T. Tap into the wisdom of your Higher Self. What would your Higher Self do? What would it say? Trust your inner wisdom. It will guide you to make decisions from an authentic place, rather than from the ego. U. Understanding. Examine why negative people act the way they do. What motivates them to be so negative? There may be hidden issues like low self-esteem, insecurities, an abusive past, low self-confidence, frustration in life, or having no purpose that make people act out in negative ways. When we have an understanding of where their negativity originates, it makes it easier to deal with. This helps us to be compassionate but not to a fault else negative people take advantage of that compassion and drain us of our energies. V. V is not for Vendetta. Negative people can push our buttons to the point that we want to retaliate. If we are not aware of their tactics, we soon find ourselves embroiled in an emotional (and in extreme cases, physical) battle. When our ego feels threatened, it wants to attack and defend. Rather than be ensnared by the ego's need for vengeance, choose to value the other person as a divine creation. We are not perfect as human beings, but our divine essence is. Look past their imperfections, their hurt and their pain, and know that they were created from the same Loving Essence that created you. W. Wake-up to your part in this. If you are surrounded by negativity, ask what you are doing to attract it. Like attracts like, and if you see only negativity and unhappiness around you, what does that say about your own mental state? Examine how you have been feeling on regular basis. Have you been feeling cranky, judgmental, or frustrated? If so, then it's time to make some changes within yourself to stop the cycle of negativity. X. X Factor. "X" is often used to symbolize the unknown. We may never fully understand why some people choose to remain in negativity or choose to do or say horrible things to others. It's part of the human mystery we must accept, like it or not. The best we can do is to learn from the experience, bless it, and move on. Y. Yield to the spiritual guidance of the universe. Give the situation to the universe, and let go. Maybe you feel you have to solve their problems, maybe listening to their complaints is your way of feeling valued, or maybe you feel guilty for their unhappiness. If this is the case, it's important to let go of trying to fix or help them. It's not what they want anyway. They want your energy, and they want you to feel as miserable as they do. Misery loves company; don't give in to them. They have to take responsibility for themselves, and they won't if someone is always there to fix everything for them. With some people, you may have to let them go altogether; the universe will understand. Z. Zap the negative people in your life with blessings, many of them. Rather than sling curses and badmouth those who have hurt you, realize that with each negative comment you send out, you will attract more of the same. This cycle must stop, or you will never see an improvement. 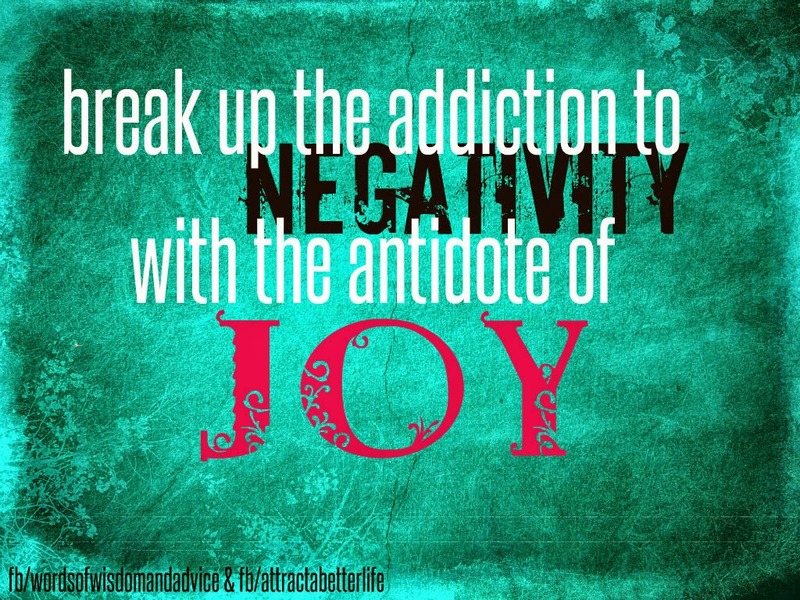 It's easy to get addicted to negativity, but the only antidote is to focus on the things that bring you joy. Send blessings their way. Pray for them. Wish them well in life. Repeat the mantra, "Love, love, love," whenever you think of them, or quietly whenever you are in their presence. Allow the energy of this mantra to defibrillate the situation, bringing joy not only to your life, but to their life as well. Negative people are going to appear in our lives at various times. We can avoid them for the most part, but there will be times when that is simply not possible. Rather than perpetuate the negativity, it's always better to take a look at what you could do to increase the positive vibration instead of lowering it. We may not be able to change negative people single-handedly, but we can model positivity by becoming self-aware, tapping into our compassion, and protecting the positive space we attract and create. Your comments are valuable. Please feel free to share your experiences in the comment section below. Penny, Penny, Penny! I LOVE this series! You have really made very great points! Seriously, I strongly believe that this series of suggestions could totally improve anyone's life in more ways than they could even imagine if they applied all these points. Words do not begin to suffice for the appreciation and love I feel for you that you created this message! Keep shining your very bright light to the world with your thoughts and spirit! Kathy, I am so happy that you enjoyed this series. It's a topic that has been close to home for me, and I needed to write about it to help others (and myself). I've gotten message after message from the Universe about this, so it was time to put it all into action. Thank you for your kind words, support, love, and appreciation. And thank YOU for being the Lightworker that you are, too...you have a gift for bringing out the BEST in people and I am so grateful that you are in this world. Your very kind words bring more joy to my heart and tears to my eyes. This was so uplifting,your blog. With this woman SuzyQ....I was trying to understand....trying to control why she is doing this to me....but I found out she spread negitive not only to me but to everyone....I've also found out that she is a very lonely person....but does that excuse her behavior.....NOPE...but like u said its her issue.. Sounds like you are on the right track, Anonymous. Focus on your joy and you will receive more of it. We can't change the behavior of others nor should we try; we are not responsible for their behavior, only ours. We can choose to engage the negativity, or we can choose a more positive course of action. Many blessings to you!